We saw many old Koginzashi in summer of 2017. One of my childhood friends introduced me to his relatives who have many old Koginzashi. They are from the family lineage of Ryo Ohkawa (1882-1958), and my friend is a great-grand child of him. They live in a large thatch-roofed house. Ryo Ohkawa was born in Hirakawa city (the former Daikouji village) and his parents were wealthy farmers. He dedicated himself to regional promotion throughout various responsibilities, such as a member of the village assembly, a chairman of the Nougyou Kyousai Kumiai, and an auditor of the Kounan Railway Company Ltd. He was also involved in the foundation of the Kimura Industry Research Institute (the former Hirosaki Kogin Research Institute). Particularly, his work to be introduced here, is that he established the Noukan Kougei Research Institute in 1915. 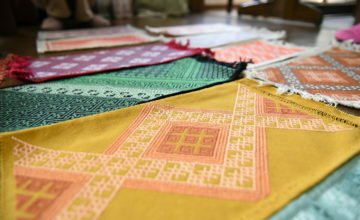 Ohkawa invested his finances in addressing product sales and development, in which he used traditional craft techniques originating in the Tsugaru district to create an opportunity for another income for farmers who were suffering from the bad harvest in 1913. One of his projects was the product development with Koginzashi techniques. 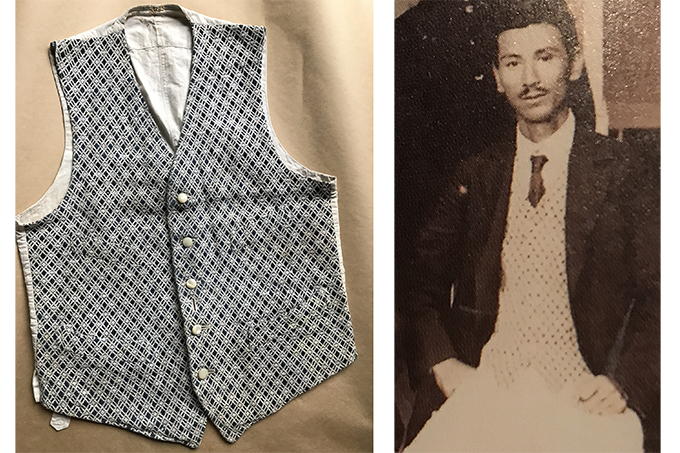 The waistcoat (the photo above) was made at the early stage of his development. Shortly after the establishment of the institute, Ohkawa sent Koginzashi products to one of his friends, Shinichi Takeda, who worked for the Mitsukoshi Department Store in Tokyo. 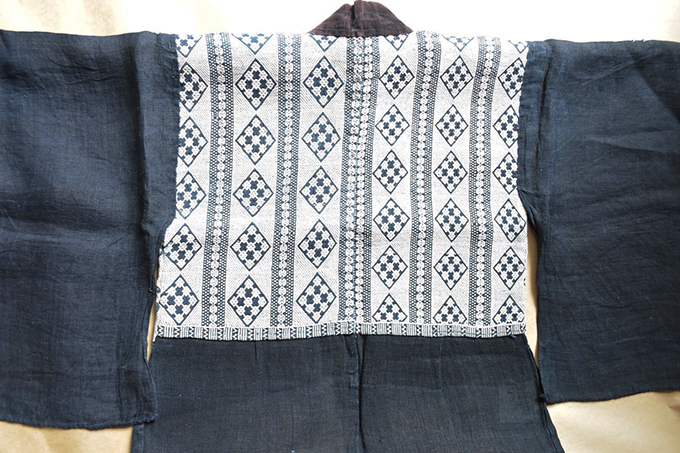 Ohakwa received his positive response, saying that after Mistukoshi tailored a waistcoat of Kogin, he will promote it, and asked Okawa to distribute more products to him. At that time, a department store was a fashion setter, at which a variety of Kogizashi products were advertised and finally took off in Tokyo. It was in the Taisho era. Handbag for female. 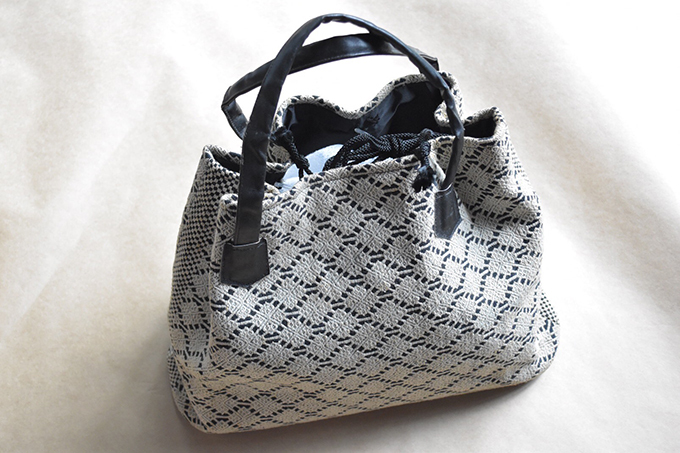 The bag was remade based on an old Koginzashi product. Long wallet (top). 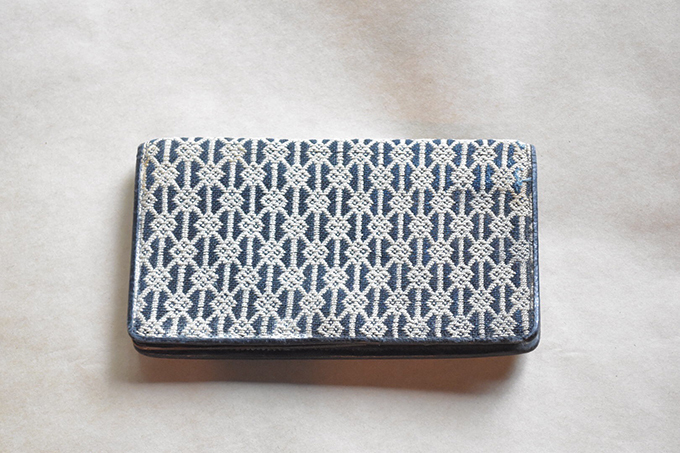 This Koginzashi was used for wallets. It looks like a cloth because of fine stitches. 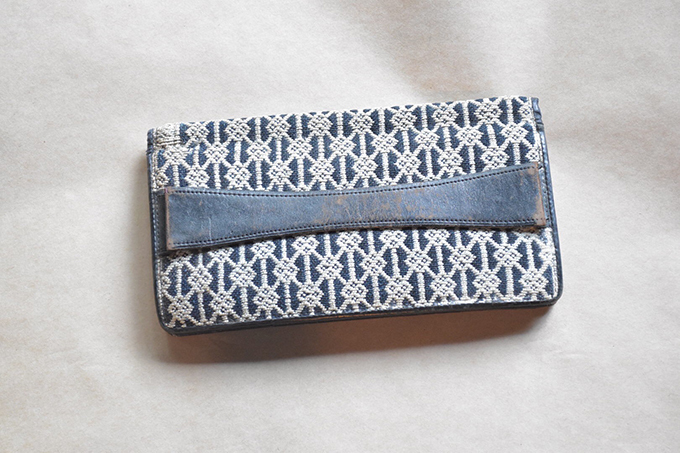 Long wallet (back). A small handle is attached to the back. 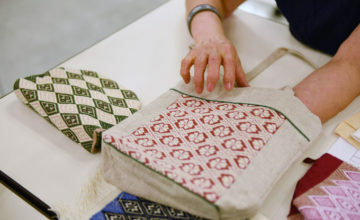 They were produced in Noukan Kougei Research Institute, where male embroiderers worked with females in the past. 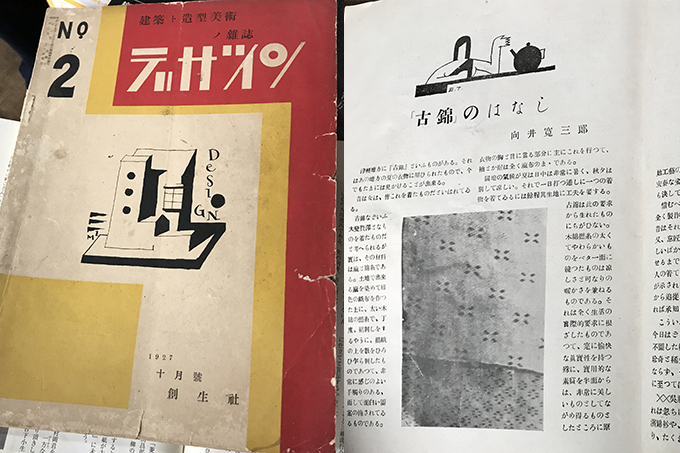 In 1927, Kanzaburo Mukai, a teacher in the design department of the Kyoto Kouto Kougei High School (the present Kyoto Institute of Technology), who came across Koginzashi at the Mitsukoshi Department Store, published “ Kogin’s story ” in “ Design” No.2, after interviewing Ohkawa. At that time, Ohkawa coined the term,“古錦” for “ Kogin.” “ Design” specialized in architecture and plastic arts became the first national magazine that introduced Koginzashi. “ Kogin’s story” outlined the tragedy of Kogin that they were destroyed during the Great Kanto earthquake of 1923 after enjoying its heyday during which the growing reputation brought by Mitsukoshi significantly increased its demand in Tokyo. At almost the same time as the publication, Mukai introduced Soestu Yangai photographs of Koginzashi, which inspired Yanagi in launching his research in collaboration with his students. Five years later, the compilation of his research was published in “Kougei” No.14 issued in 1932. Afterwards, “Koginzashi” became widely known all over Japan. Personally, I feel that Koginzashi products made after the Showa era are too feminine and are something like a women’s hobby, while all products that the family presented were cool and masculine, and the design was astonishingly attractive despite being produced prior to the Showa. What is special for me was that they are the originals contributed to the establishment of its fame, and the man behind the background was Ryo Ohkawa. The most interesting thing is that Ohkawa and other men, who fell in love with its geometric patterns consisting of indigo and white, brought the today’s Koginzashi we adore its colourfulness and loveliness. 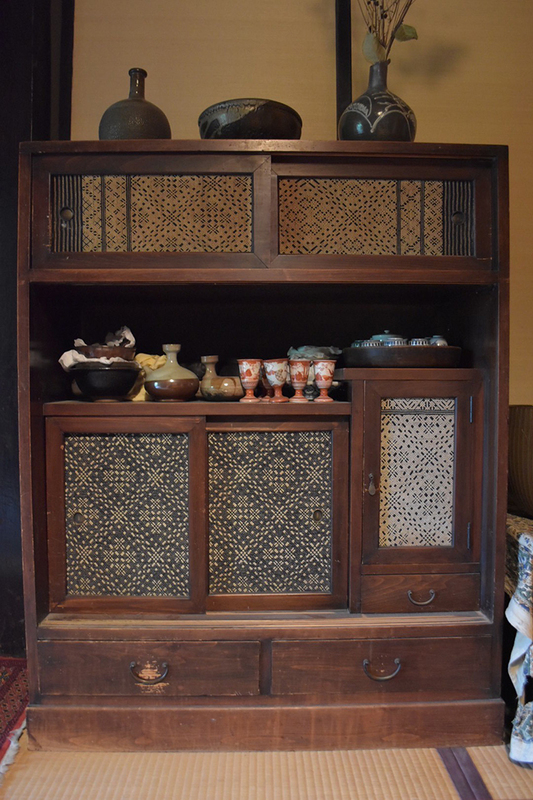 We had a chance to see a Koginzashi product with a rare pattern, which is a part of Ohkawa’s collection and was also introduced in “ Kougei” No.14 in 1932. The design features the modoco lining up vertically. At first sight, it was not clear for me whether it is Nishi-kogin or Higashi-kogin. After careful observation, I found it is Higashi-kogin, which was used for special occasions. We found a fantastic cupboard. Koginzashi was used for the doors. Every door is decorated with Koginzashi. They are West-kogin as the doors on the top have stripes. Apparently, working clothing of West-kogin was often used for product development. The two large doors on lower left have the same pattern as the back of the door on lower right. The door represents the charm of the reversible Koginzashi. Apart from Koginzashi, with famers nearby, Ohkawa developed uncountable numbers of products, such as a doll made from a local stone and accessories with the pattern of a straw raincoat knitted by famers. Many of those were awarded at exhibitions and were highly appreciated nationwide. 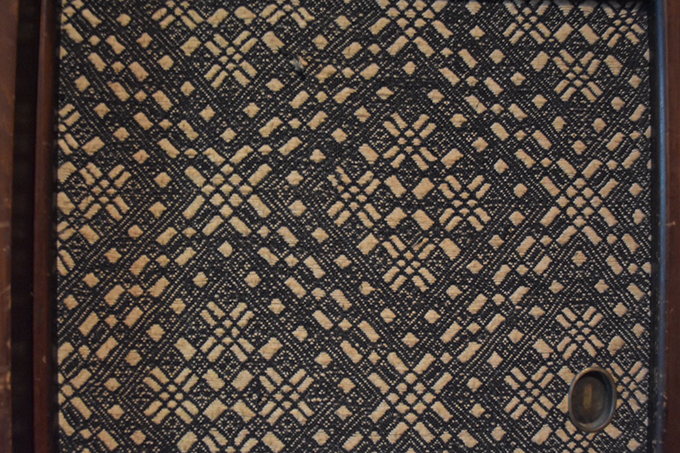 It appears that Ohkawa is a pioneer of the modern collaboration between a traditional craft and a designer, given that his many years’ development of the local tradition and techniques. All the products they introduced us were almost 100 years old, however, the design is clear and has remained as it is. I felt that the family’s love and thoughts for their ancestors and their inherited precious cultural assets. As a person who is involved in traditional culture, it was a fantastic opportunity in which we were able to learn many things alongside the original Koginzashi. Mingei No.742. Nihon Mingei Associaiton, October, 2014. Izumi Kuroishi. 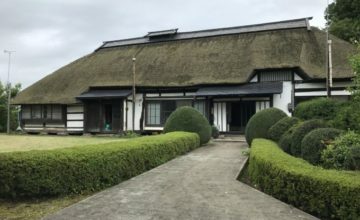 Tohoku earthquake disaster restoration and Jiro Konwa:wisdoms of monozukuri and kurashizukuri. Heibon Press, March, 2015. History of Aomori prefecture:　cultural assets and art crafts. Aomori Prefecture, September, 2010.